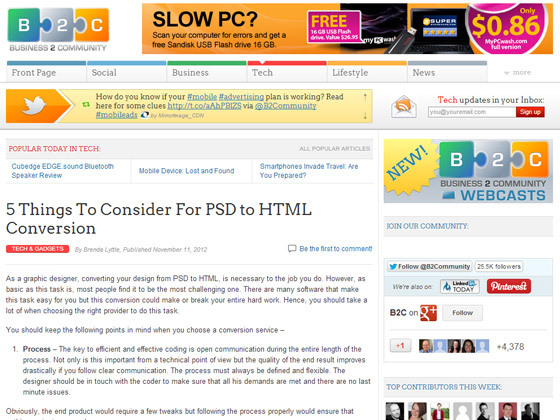 As a graphic designer, converting your design from PSD to HTML, is necessary to the job you do. However, as basic as this task is, most people find it to be the most challenging one. There are many software that make this task easy for you but this conversion could make or break your entire hard work. Hence, you should take a lot of when choosing the right provider to do this task. Process – The key to efficient and effective coding is open communication during the entire length of the process. Not only is this important from a technical point of view but the quality of the end result improves drastically if you follow clear communication. The process must always be defined and flexible. The designer should be in touch with the coder to make sure that all his demands are met and there are no last minute issues. Obviously, the end product would require a few tweaks but following the process properly would ensure that nothing major is messed up. Cost– In the world of graphic designing, quality takes top priority. But that does not mean that cost has to be ignored. Cost should be the second most important thing on your list of considerations and there should always be a balance between cost and quality.When you enter into a contract with professionals or freelancers, you have to see their methods of costing. Do they charge hourly rates? Do they just give a rough estimate in the beginning? Some people hire freelancers with less experience to save on costs but if you do that, make sure that the quality doesn’t take a hit.